In April, junior and senior class students from Kiev Christian Academy visited our kids' high school, BMA, here in Frydlant. Caleb and Claire so enjoyed meeting MK (missionary kid) counterparts from the Ukraine. Although these kids' parents serve with other organizations, there is just something about MK's meeting each other that connects and bonds them to each other, even after a first time meeting. It wasn't long after they left that Caleb starting asking us if he could go to Kiev to visit them. Thinking that it would be prohibitively expensive, I told him he could look into flights and that we'd see about it. I never dreamed he'd find a ticket that was reasonable. But...he did! $75 ROUND TRIP!! Can't really say no to that kind of a price! 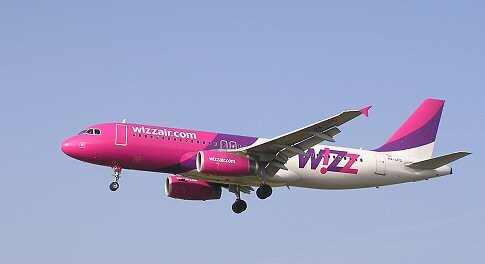 So yesterday I put him on a pink Wizz Air flight out of Katowice, and sent him off to visit his friends in Kiev! As I drove away from the airport I was thinking, "Who sends their kid to the Ukraine to visit friends??" The kids got back from our church's English camp this afternoon, as did 14 other groups who were at camp this week across the Czech Republic! This was the largest round of camps (we have three rounds during the summer) here in Czech. Praise God for all the young people who heard the Gospel this week! English camps couldn't happen without the help of American teams who come over for two weeks to join us in this ministry. 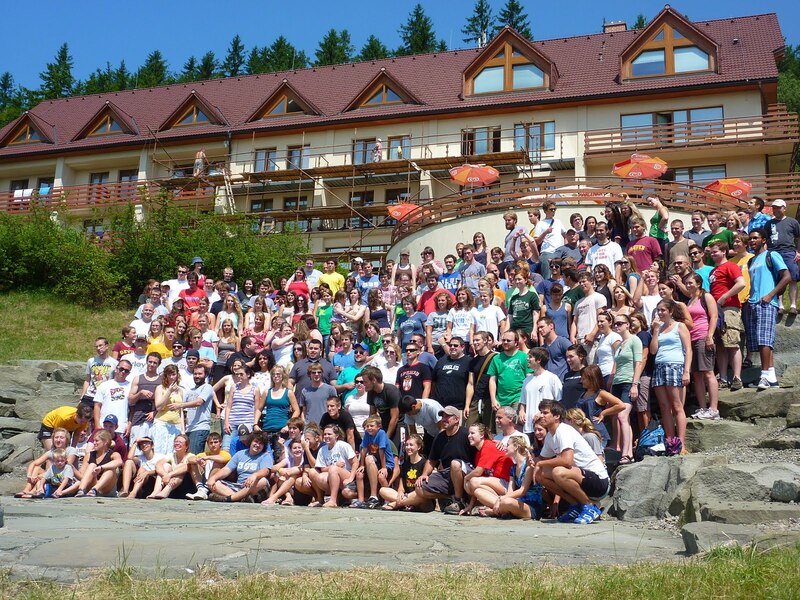 Over 250 people were here in Czech this week, sharing their lives and the Gospel at English, music and sport's camps across the country. We are so blessed by all the American churches that partner with us across Eastern Europe during camp season! Bless you all!! Now that students are returning home, please do pray for all those who heard the Gospel at these camps - that what they heard will resonate in their hearts and draw them to a relationship with the Lord. After yesterday's frustration with Blogger I went to the best source I knew for help...Tyler! Thankfully he had a free day today so we both got on Skype (him in Croatia, me in Czech...gotta love technology when it works!) and he walked me through how to fix my problem. Turns out I didn't have the latest version of Blogger...thus the problems with my pictures. I love when it's that easy! Before I got a hold of him, I did a whole bunch of internet searching to see if there was somewhere else to house my blog. While there are other places (and I even signed up and tried two other ones just to see how they worked! ), I think I'll stay with Blogger for now. Hopefully the updated version will allow me to do what I want with photos, and just keep on blogging about life here! I am seriously having issues with Blogger...where this blog is hosted. Putting in pictures doesn't work the way it used to (for instance, once I've put in a picture I can't seem to delete it if I find a different one that I want instead)...it does funky things with my headings and paragraphs...it's not working like I want it to...ugh. What to do? And now I just found out that my background goes away on Friday unless I go into the website where that's hosted and choose it (or another one) again...but they're website is having issues due to overload on the server so is not reachable...DOUBLE UGH! I think it's time to make some sort of a change, but I know that takes time to do (like, making my own website). If/when I make a change, I'll let you know. But for a bit...it may not look like it usually does! The post below is an example of that already...it's just not working right today! However...the blog post is a good one so please read on! right now, during the heat of summer, it's my favorite season! We have already had such a great summer. The kids ended school early (gotta love that!) and we headed to the States for three weeks. I already wrote about our week at Gull Lake Ministries (total plug here...if you're interested in joining us there, we'll be back first session 2012. Dave gets to speak there again...already happy to think of returning!). Now just want to get caught up on the rest of the trip! Caleb and Claire headed to be with my parents in Oregon for the second week in the States. They flew by themselves, experiencing the joys of internet on Alaska Airlines while flying! Picked up in Portland by my brother, they then headed down to Eugene for five days of happy times with my parents...a trip to the Oregon coast, lots of Starbucks, summer clothes shopping, visiting friends up in Portland, strawberry picking...total delight for all involved! to be able to do that?? I miss that! 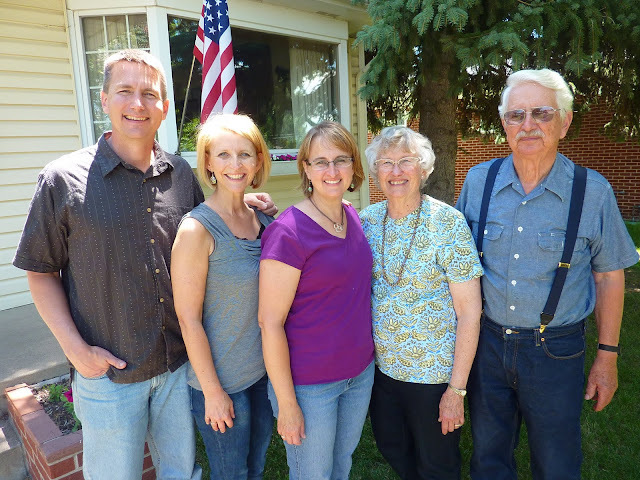 Dave's cousin, Carol, picked us all up and we headed for his folks' house, even though they were in Wisconsin at a Cadence staff conference! But Dave's childhood home welcomed us well and we enjoyed looking at Grandpa's garden that evening before heading for bed. ds, the Chase's, and to be at another one of our dear supporting churches, Faith EV Free where Dave preached Sunday morning. Spent Saturday up in the Rocky Mountains near Estes Park - truly one of the prettiest places! What a great day (and week-end!) that was! 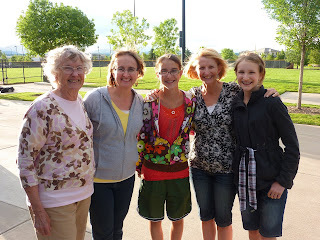 Then had a week with family in Englewood...ahhh, those are the things that good summer memories are made of! Good meals around mom and dad Patty's table, ceramic painting and ice coffee with Joyce and Kyrie (sister-in-law and niece), brother-in-law and nephew's baseball game, shopping with the girls, morning breakfast with my dear friend Jerri, meeting up for coffee and Qdoba with the Chase's in Longmont, shopping at Whole Foods for gluten free things to bring back for vacation, watching Caleb take his driver's permit test at the DMV (he passed and then got to have Grandpa teach him to drive! )...ALL SO GOOD!!!!! 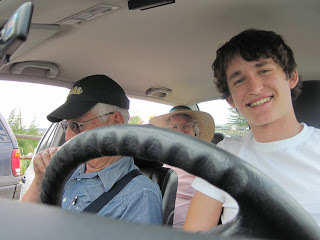 Caleb actually stayed an extra five days so that he could get in some driving lessons with Grandpa, who even let him drive a long 200 mile trip one day to really cement all he'd learned! He won't be able to get his license until he's 18 (which, gulp, is in just six months!) but it got him started! After so much goodness, it felt right to come back home to all that's going on here this summer...I'll write about that in another post though!